This post was written by Polly Walker from World Vision International and Raymond Owusu from World Vision Ghana. The global community has increasingly recognized the contribution of Community Health Workers (CHWs) in reducing maternal and child mortality in the hardest to reach communities with lowest access to health care. Over the last two years the government of Ghana has been working closely with the One Million Community Health Workers (1mCHW) Campaign to develop Ghana’s CHW Roadmap and Implementation Guidelines. The Roadmap is a strategic financial and operational plan for implementing CHW program at scale to address the changing health needs of the Ghana population, and harmonize donors and NGO investments in CHWs. World Vision has been at the forefront of harmonization of CHW programs, supporting national initiatives as part of our Recife HRH commitment. So, when the Ghana Ministry of Health (MOH) and 1mCHW Campaign Secretariat approached World Vision, and invited us to support the MOH to design a state-of-the-art CHW training program, we were delighted. Firstly, it was a chance for WV Ghana to engage and support a national program, which could then roll out to our project sites and other hard to reach communities. Secondly, and perhaps most excitingly, it was a chance to challenge ourselves to bring together many health, nutrition and child development/protections innovations and combine them in a comprehensive, integrated approach. The process took a year to complete, challenged at every turn by stakeholder consensus, buy in of vertical government initiatives and financial support being slow to emerge. The curriculum creation was a process of hybridization, building from materials successfully used in this contexts from the Ghana Health Service, Millennium Villages Project, World Vision, together with the latest evidence-based tools from the WHO and UNICEF. The writing team included local and international specialists, and a stakeholder consultation group transecting the Ministries and contributing departments in the Ghana Health Service. A draft curriculum was circulated in September 2015, and the Training of Trainers took place in February 2016, and was met with great enthusiasm. Whilst the program encompassed a list of more than sixty services, it does so in a way that integrates them into 4 core activities and home visits in the community. The training course it self takes approximately 6 months to complete, which includes 8 weeks in the classroom, organized into 3 modules. Between each module a period of field experience is implemented in which the supervisors (community health nurses), and community health management committees (CHMCs) observe and review their work before progressing to the next module. The course is designed to provide training on comprehensive preventive and emergency health care and support, encompass the core health needs of the whole family, including adolescents, adults and the elderly. Furthermore, the service package will strategically target the most vulnerable families with lowest access to health, whilst also addressing the social determinants of health and wellbeing that contribute to a generational cycle of poverty. 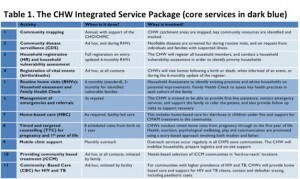 The service package (Figure 1) is organized into three modules: Community Health Basics, Community-Based Care, and Timed and Targeted Counselling (for pregnancy and first year of life). World Vision is known for its ‘Lifecycle’ approach to health, supporting communities to move from ‘survival’ interventions to more holistic methodology, including adolescents and early child development. Our ‘Healthy Families’ Approach takes a simplified integrated approach to behaviour change communication for essential household practices, based on a needs assessment conducted in the home by the CHW, together with the caregivers and household head. The assessment encompasses the basics such as water, sanitation, bednets and family food supply, but also looks at child safety, protection and nurture in the home, promoting an environment suitable for child development. 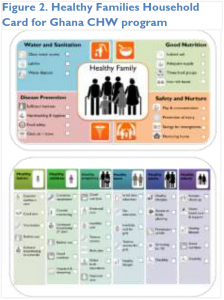 The Family Health Card (Figure 2), roots the approach in negotiation and dialogue counselling technique, but ensuring male and household member involvement, and accountability for improvements. All family members are engaged through the Family Health Check including women and children, adolescents, adults and the elderly. Health of the elderly and adolescents were priorities for the Ghana Health Service, who wanted to take a rights-based approach to basic health promotion, ensuring essential practices for every family member, excluding none. During the training they learn about the importance of the lifecycle approach and how it contributes to a virtuous generational cycle of health, particularly well demonstrated in the “Leaky bucket” exercise. In this exercise CHWs relentlessly fill the bucket with child health interventions (vaccines, hygiene, deworming) for every new generation, whilst the water pours away, as early life gains are lost later due to lack of adolescent health, child development and protection. This aspect teaches CHWs to address play and communication using UNICEF’s Care for Child Development methodology, with a special focus on vulnerable children affected by HIV or malnutrition. CHWs will also be trained approaches for identifying and addressing mental health and psychosocial support through Psychological first aid, adapted for CHWs to work with families. Issues of mental health and child development are cross cutting themes. They emerge in the routine home visit, where CHWs counsel parents on a ‘child safe’ environment as well as ‘child-friendly’ nurturing home, and the importance of toys, and quality play time with both mother and father. Both the CCD approach and routine visit emphasise the importance of child protection from violence and abuse in the home, and promote positive discipline and play as critical elements of emotional learning, health and development. Timed and Targeted Counselling (ttC) was developed by World Vision in 2011, and rapidly ‘went viral’ with 23 countries now implementing, and 6 countries have adopted as part of their national CHW approaches, and is increasingly seen as a best-practice for health promotion for MNCH. Ghana is the 2nd country to adopt TTC-2 since its release in 2015. TTC encompasses MNCH essentials for pregnancy, newborn and child health through its distinctive problem-solution storytelling approach where men and other family members roles in supporting the mother and child are elevated. TTC-2 further prioritises support for vulnerable cases and families, and integrates care for the small baby, chlorhexidine cord care and support for PMTCT and early diagnosis of HIV. CHWs are being deployed to the most vulnerable and hard-to-reach communities in Ghana, yet even within communities child mortality and poor health cluster in certain families due a combination of social, psychosocial and physical factors, underlain by the social determinants of health. It cannot be assumed that CHWs will naturally prioritize the most vulnerable households. In fact, GPS tracking of CHWs often reveal clustering of service to easy-to-reach homes. In this model, Ghana has created a list of vulnerability factors considered during HH assessment. Priority homes such as adolescent parents, or a child who is orphaned/cared for will receive more intensive visiting schedules. Factors that emerge during care, such as child protection, family violence, or chronic/severe malnutrition could also lead to prioritisation as a ‘responsive care strategy’. This ensures investment of time for those most at risk, and ensures Community nurse’s time is also well used. CHW performance goals include how well they cover those priority and hard to reach homes, and emphasise health promotion to ‘non-adopters’. We all talk about male involvement, but it’s often tricky to put it into action. Lessons from ttC research studies demonstrate the importance of including male participation as a core performance indicator for CHWs, otherwise, they’ll conveniently exclude them due to timing of visits. Male involvement in the Ghana CHW program is not about the fathers’ sitting passively in counselling sessions: men as partners and as fathers are elevated in the important contributions they make to the health and development of babies, children and teenagers. They feature prominently in storybooks and counselling cards, and directly engaged in the Household and Family Health Checks. Ghana has been scaling up Community-based Management of Malnutrition in recent years, using basic community health units (called CHPs compounds) to provide outpatient care (OPC) to severely malnourished children. Several gaps in service delivery of CMAM are now being fulfilled by the CHWs. 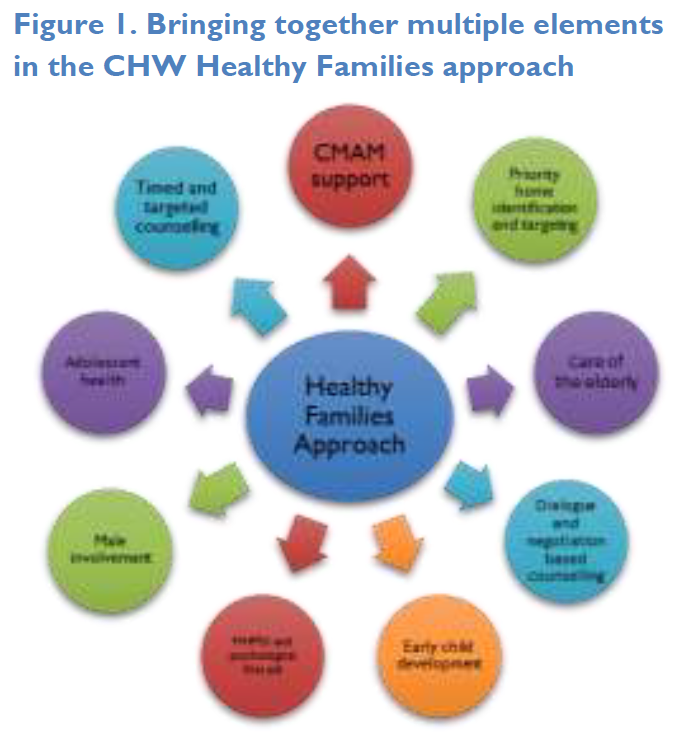 CHWs provide home-based care to support adherence and counselling for improved feeding during and after the OPC program. They conduct ‘root cause assessments’ with the family members looking at water, sanitation, disease, feeding and food security, then will track the transition from RUTF to an improved feeding plan until the child is fully recovered and doing well. The accompanying tools, e.g. food diary (Figure 8) are currently under field test pending proof of efficacy for scale. 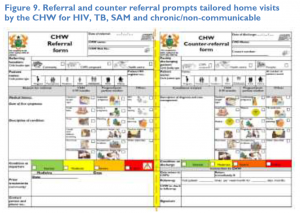 Now rapidly becoming used world-wide, individualised home-based care in the Ghana model is elicited by the referral/counter-referral form (Figure 9.). This form is completed by the health centre or hospital on patient discharge, and includes instructions for medicine adherence, follow up care and clinic appointments. 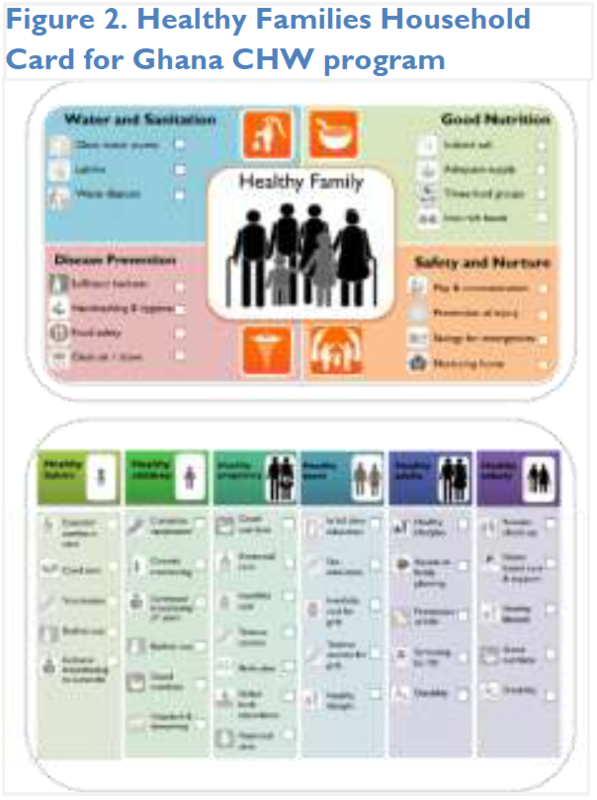 This simple user-friendly tool enables individualised care plans and home support for a wide range of conditions including HIV, TB, malnutrition, and non-communicable or chrnoic diseases which are also captured in the training materials. 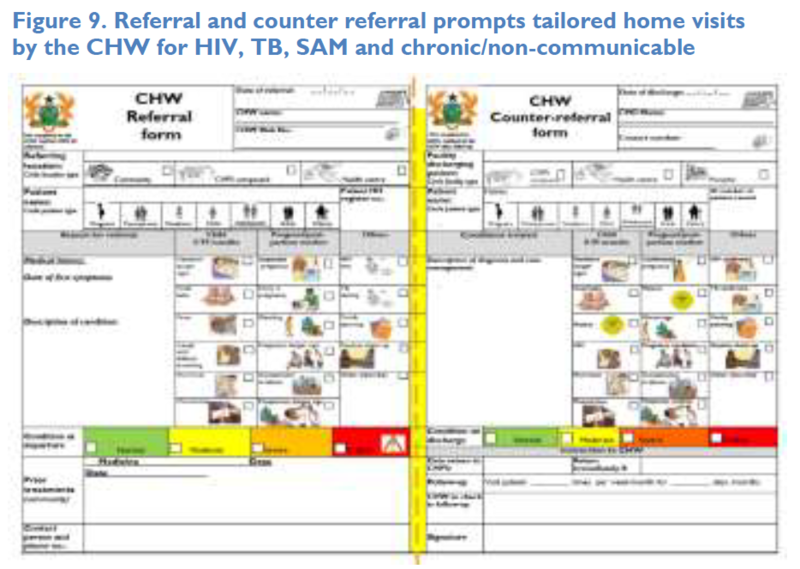 The tool also promotes follow up by CHWs for all referral cases. The program includes training CHW supervisors which addresses many of the gaps typically found in CHW supervision. The training prioritises attitudinal change in the supervisiors, promoting an environment of mentorship and building skills for positive communication, and motivational interviewing strongly based in behaviour and communication theory. A simple competency framework drives the supervision with compehensive tools for case evaluation, spot checks, observations of service and individual performance evaluation. The bulk of data collection analysis is pushed back towards the groups setting, where ‘Threshold Scorecards’ are used for participatory action planning and identification of critical improvement areas and collective ‘group-think’ and solution finding is emphasised. In individual supportive supervision, the emphasis is on performance, quality and on-the-job mentoring, data collection is stripped back to a set of “Key Performance Indicators” preventing the supervision becoming dominated by data collection processes. Mobile health applications for data collection are currently being developed in Ashanti region using CommCare technology. The Ghana CHW program is being lanuched nationally through partenrship betweeen the Ghana Health Service and the Youth Employment Agency (YEA). The YEA will be recruiting, training and deploying 19,500 CHWs and 500 eHealth Technical Assistants through a two year initiative where the CHWs will be paid a basic stipend and encouraged to progress their work into the health sector as a whole. The program will focus on hard to reach and vulnerable communities. World Vision Ghana and the 1mCHW Campaign are working together with the government to support the roll out, and advocate for other partners to engage and align to the national intiative. Ghana’s health needs have changed in recent years, as an African nation in economic transition, with increasing urbanisation shifting rural population demographics. The CHW approaches outlined here, whilst addressing essential maternal and child health needs, also take bold steps forward, showing Ghana government’s willingness to move beyond the MDGs era, and focus on how to achieve the Sustainable Development Goals and taking Universal Health Care beyond its typical domain of maternal and child survival. In the words of Ghana Health Service’s PPMED Deputy Director, Policy, Charles Acquah, this is a “paradigm shift for Ghana and has the potential to transform health from the community upwards.” Exciting times!